Belgium has a fabulous modern train system. If only the timetables reflected reality a bit more. By the way, in Flemish, Bruges is spelled Brugge. 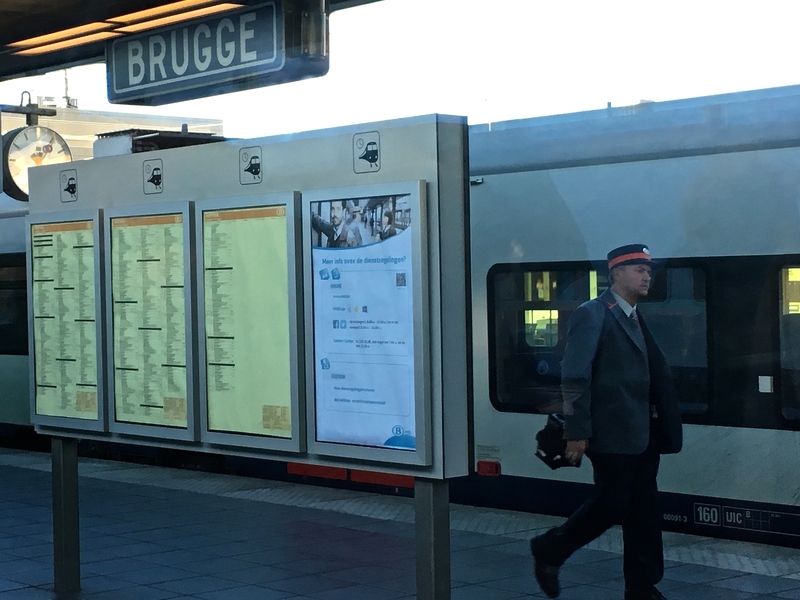 Our trip to Bruges began with a train ride from Brussels that confirmed the truth behind the Belgian saying: “Everything’s broken; but it still works.” First, the train to Bruges didn’t appear on the depot’s main display. Then, when we asked the staff for directions, each person had a different departure time and track on their computer screens. Finally, the platform that advertised its destination as Bruges was actually going somewhere else. We managed to catch the right train only because Matthew looked across the tracks and saw the Bruges-labeled cars at a different platform. 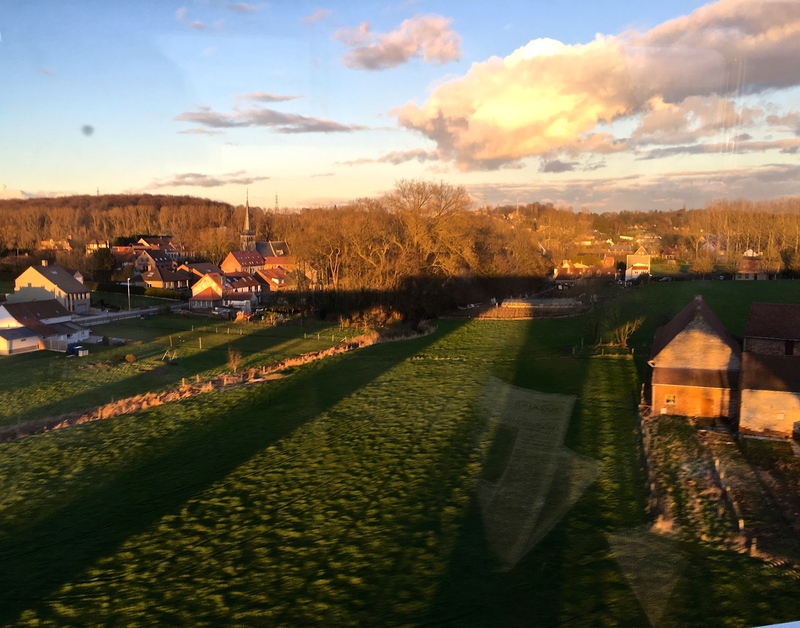 We and a whole host of other confused travelers ran like maniacs and barely managed to hop on as the train was pulling away. When we inquired about the issue, the conductor said, “The other track has been broken since yesterday, so we just used this one.” Nice. A bit of a head’s-up might’ve been helpful for the staff and passengers. This was about as close as we came to “suburbia.” Many folks had at least a few chickens scratching in their backyards, and several homes boasted beautifully espaliered orchards. Canals drained swaths of farmland, while surrounding wetlands dotted with clumps of sedges and scrubby trees harbored lots of wildlife. It seems that European countries recognize their limited physical space and choose to preserve as much land as possible by creating incredibly dense cities. 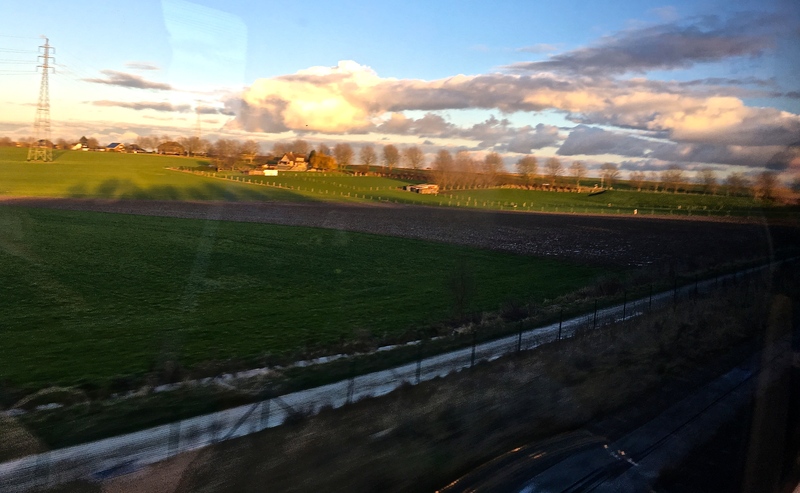 As a result, a mere 20 minutes outside Brussels, we rolled through vast tracks of flat farmland and wetlands where sheep grazed and waterbirds foraged. Another surprise: I’d say almost half of the houses, apartment buildings, and businesses sported solar panels on their roofs — pretty impressive for a country whose waterlogged condition testifies to a fair amount of cloudy days and rainfall. You can’t beat Bruges for Medieval ambiance. In any case, after an hour, we pulled into Bruges and caught a bus to our hotel. As we rode along, the size of the city astonished us. We’d expected a tiny hamlet from our In Bruges exposure. But what we found was a substantial Medieval town. Row after row of timber-and-brick Flemish houses nestled along cobblestone streets. Every corner bristled with Gothic spires. A ring of canals meandered through and around the town, giving it a feel similar to Amsterdam. I can’t say enough about how beautiful Bruges is, so I’ll let the photos do the talking in my gallery below. Bruges was once called the “Venice of the North” for its lovely canals. Note the swans — the symbol of Bruges. Legend has it that a famously long-necked, 15th-century mayor collaborated with the Austrians and was beheaded by the townspeople for his betrayal. The angry Austrians cursed Bruges and said that similarly long-necked swans would forever haunt its canals to remind its citizens of the murder. Note the daffodils just popping up in the tranquil Begijnhof courtyard, where women of the nun-like lay order known as the Beguines once lived. (I can’t say that word without thinking of the Big Band tune, “Begin the Beguine.” Look it up on YouTube.) Single religious women and Benedictine nuns still live here. A particularly picturesque scene, complete with horse-drawn carriage. I have to say, Bruges boasted some of the most gorgeous horses I’ve ever seen. Even the main shopping drags are charming. A gilded “skyway bridge” (part of the old Civil Registry) makes an archway to Blinde-Ezelstraat — meaning “blind donkey street.” The fishermen would stop here to put blinders on their donkeys so that they’d cross over the canal bridge. The fish market, where you can buy the day’s fresh catch on weekday mornings. 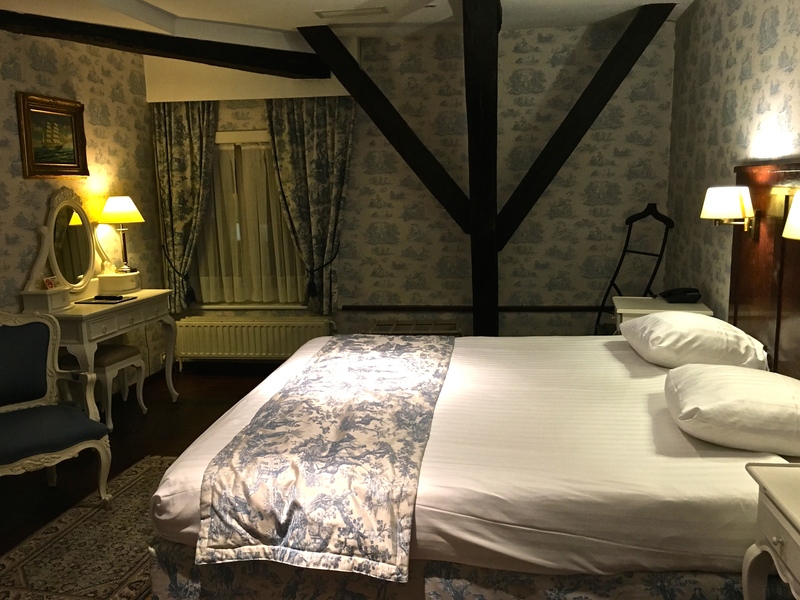 Our cozy timbered room at the Hotel Patritius. 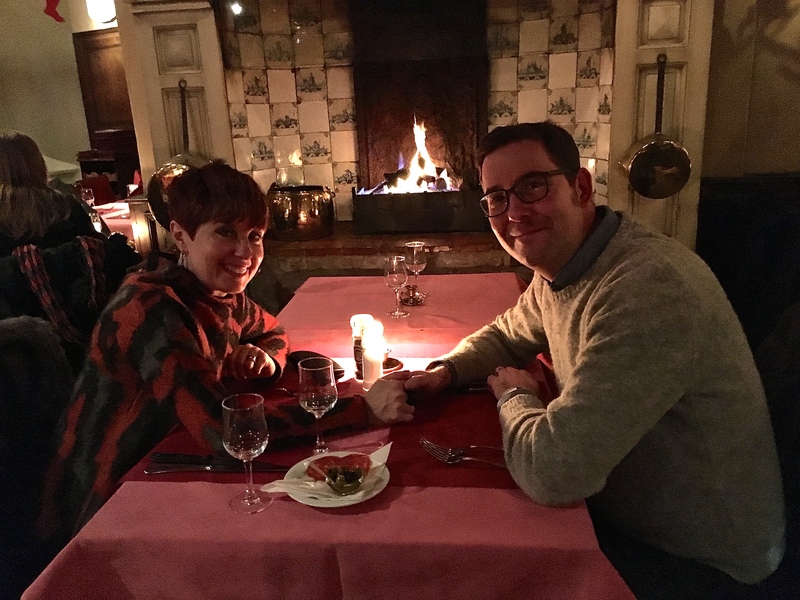 We checked into our fairytale B&B, a gorgeous 1830’s mansion known as the Hotel Patritius, which is run by the lovely Spaey family. (Incredible rooms, delicious breakfast.) And then we hit the ground running. But rather than giving you the full day-by-day, play-by-play, I’ll hit the highlights below and illuminate them with a few photo galleries. Let me also give you an advance warning — this is my longest post ever ’cause I was simply too lazy to break it up into several entries — so grab a comfy chair and a cup of coffee before proceeding. Colin Farrell ain’t lyin,’ kids. 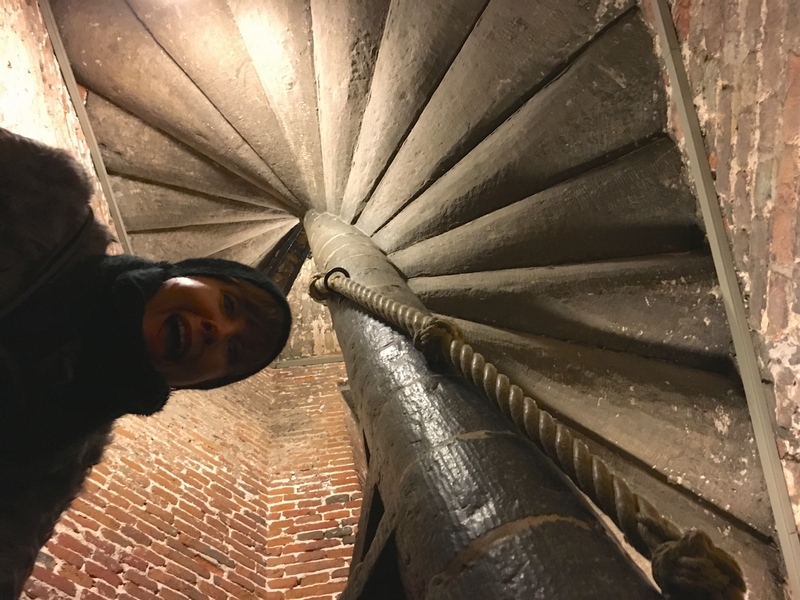 The Bell Tower stairs (366 steps) are no joke. Of course, since In Bruges inspired our visit, we had to hit the Bell Tower right away. Probably one of my favorite scenes in the movie is when the “fat American family” (with suspiciously Irish accents) chases Colin Farrell around the courtyard for his not-so-gentle warning that they shouldn’t attempt the steep climb. He was right. It’s not a hike for the heavyset. Beyond the innumerable spiraling steps, the stairwell itself is so narrow that many folks had to sidle up sideways. 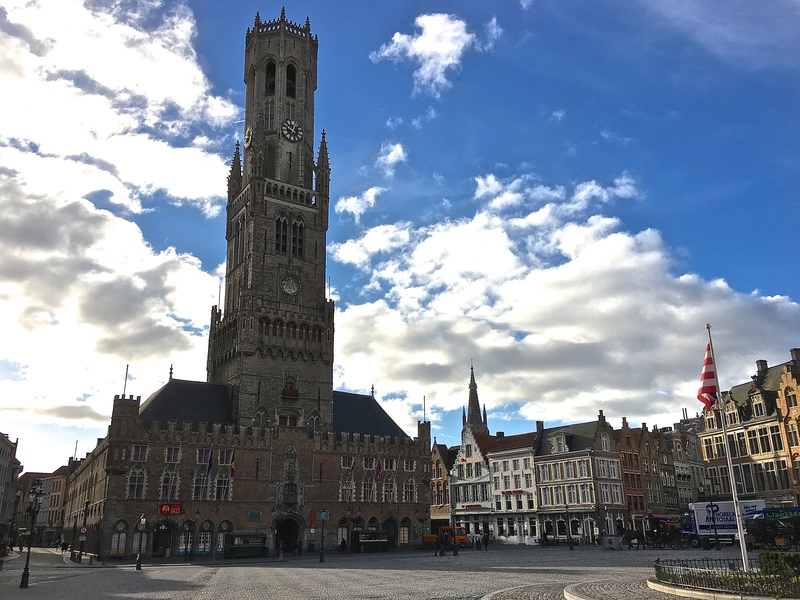 Bruges’ original belfry, built in 1300, got its octagonal lantern in 1486, making it 290 feet high. But what a reward at the top! And I don’t mean just the incredible view out over the town. The chance to watch the various ways to ring the bells is unbeatable entertainment. Fingers in my ears to dampen the sound, I witnessed from closeup how an enormous giant barrel — pegged like the cylinder in a music box — triggers the levers that ring the time. Then I peered into the little carillon room to spy on the carillon-player, who sat at his organ-like instrument, pounding out the tunes with his feet and fists. Definitely the coolest moment of the trip. The tower’s 47 bells are linked to wires leading to hammers and clappers. As the giant music-box cylinder turns, its tabs trigger the hammers that play the bells. I’m constantly amazed by the levels that humans go to to entertain themselves. These clockwork and gears keep the time. I geeked out watching the little lever-n-cog system that ticks out the seconds. Looking out over the city through the hands of the clock reveals the city’s pretty red-tiled roofs. An engraved “signpost” encircles the entire viewing platform and displays distances to nearby cities. Check out all the wires that control the multiple hammers striking the bells. Every bell has several hammers so that the same note can be struck in rapid succession to carry a tune. You can see just the ends of the little wooden levers that stick out of the carillon. The man strikes these with the edge of his fists, using them like hammers. His feet get in on the action, too, by stamping out some of the deeper notes on pedals. By the 14th century, Bruges had become the largest cloth-trading center in northern Europe, and one of the biggest cities in the world. Burg Square is its historical birthplace. Bristling with spiny Gothic arches and glittering with gold leaf, this eye-popping plaza bears a marked resemblance to Brussels’ Grand Place. For good reason. 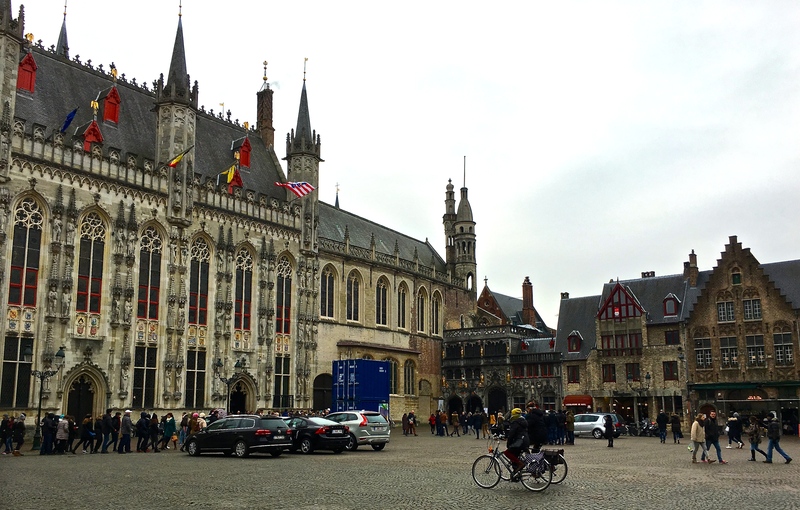 Bruges’ City Hall (on the left in the photo) stood in as the model for the one in Brussels. The bride is in blue, holding a bouquet of pink flowers. We happened to arrive at City Hall just as a bride exited the place. Let me confess right now: There’s nothing I love better than wedding crashing. So I acted the fool for awhile and snapped some shots like a paparazza, then we headed inside the building. The main draw is the Gothic Room, which is plastered in 19th-century frescoes that read like a giant comic book, telling the story of Bruges. But the wooden ceiling gets my vote for delivering the knockout OMG moment. Its dangling arches somehow remind me of stalactites hanging from a cave. I’m not sure that this would be the best room to get married in, however. It’s so colorful and majestic that anything less than an Elizabethan gown might feel like a letdown. City Hall’s hanging arches are known as “pendentives” and are 19th-century reproductions of the original Gothic wooden ceiling. The fabulous fireplace touts the 13th-century proclamation that “All the artisans, laborers, and citizens of Bruges are free.” Pretty emancipated thinking for the time. The romantic paintings that parade around the room include this image of famous Flemish Primitives painter Jan van Eyck, who is pictured being visited in his studio by Bruges’ mayor. Matthew admires the 17th-century Baroque Provost’s Palace. Here, angels holding inferior relics kneel to acknowledge the vial’s superior status. On the far left, an angel looks sad because she’s only got bragging rights to Veronica’s veil, the whip used on Jesus, and the dice tossed by the guards who gambled over his robe. 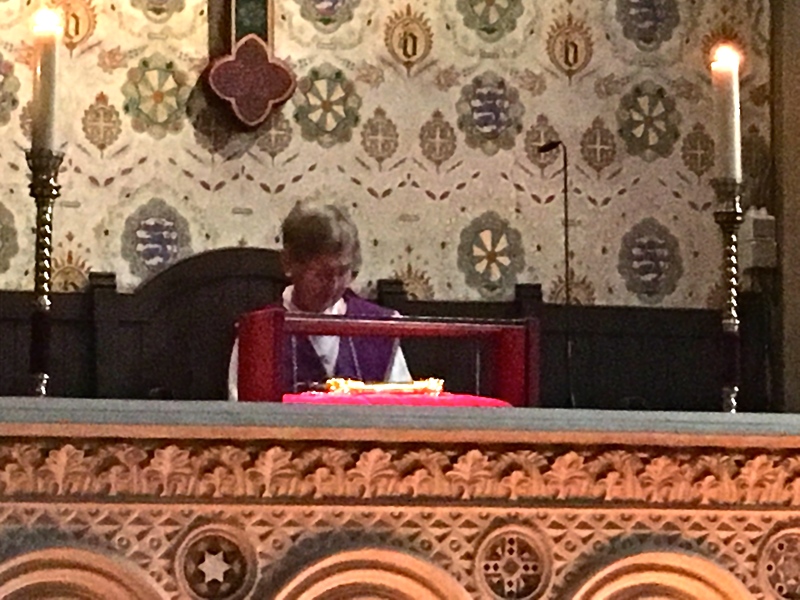 And on the far right, another hopeful-looking angel has cobbled together everything else she can find — the crown of thorns, Jesus’s robe, and a few other paltry bits. Her stuff just doesn’t measure up, though, as a ring of cupids clearly forms a halo around the winning vial. On visitation days, the vial sits in a little glass box for the faithful to admire up close. Everyone’s reverential mood now cut short, we clambered up the stairs where another lady stood waiting to take our money. After a quick genuflection, we got a brief gander at a rock-crystal vial that held a fairly substantial amount of pink stuff. Then the lady handed us a pamphlet containing the recommended prayer and a photo of the relic. Looks like a pulpit tailor-made for Michael Jordan. It’s supposed to be a globe, but I’m thinking more like Globetrotters. Business transaction complete, she briskly removed the vial from its case, wrapped it up in a cloth, and perfunctorily toted it away in what looked like an old metal tool box. Okay, not the most transcendent moment, but entertaining, nonetheless. The show wasn’t over yet, however. 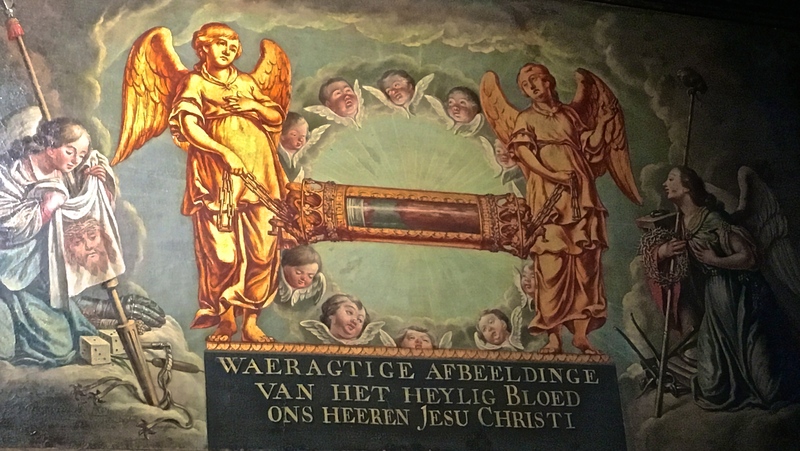 The church interior itself, which was gutted by Napoleon in 1797, contains a vivid 19th-century, Neo-gothic mural that tells the story of how the blood got to Bruges. Every year on Ascension Day, it’s still paraded around the streets by townsfolk dressed in Medieval costumes. 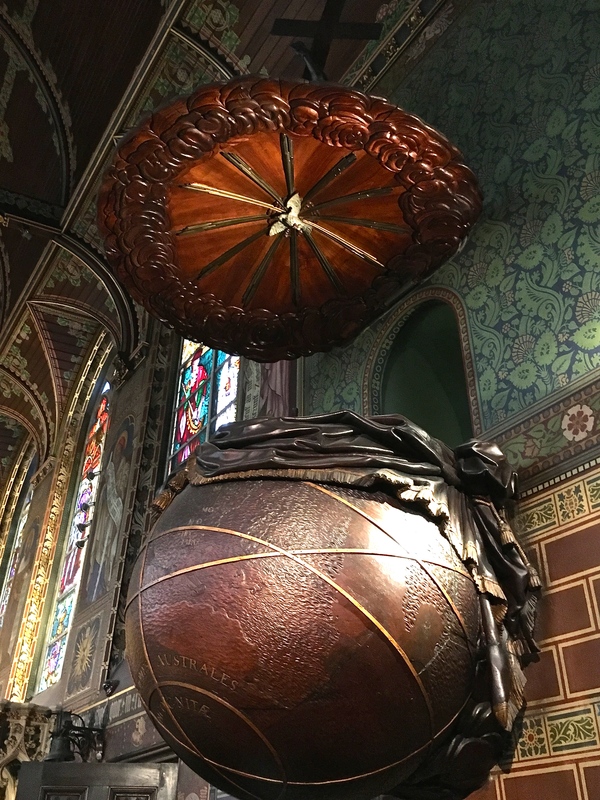 My favorite church furniture, though, had to be the pulpit, which bore a strong resemblance to an NCAA-regulation basketball. The interior of the church has an amazing ceiling and frescoes that tell the story of the blood-filled vial. As the story goes, while prepping Jesus for burial, Joseph of Arimathea preserved the blood washed from the Lord’s lifeless body. During the Second Crusade (1150), Derrick of Alsace saved Jerusalem from the Muslims and was rewarded with the vial. He carted it home and presented it to Bruges’ Bishop (the scene portrayed in this mural). The dried blood suddenly turned to liquid, a miracle that continued to occur every Friday for the next 200 years. When not on display, the vial is usually kept in this silver tabernacle. You’d expect dried blood to be brownish. But seen up close, this stuff is pinky red, kind of like dried Kool-Aid. 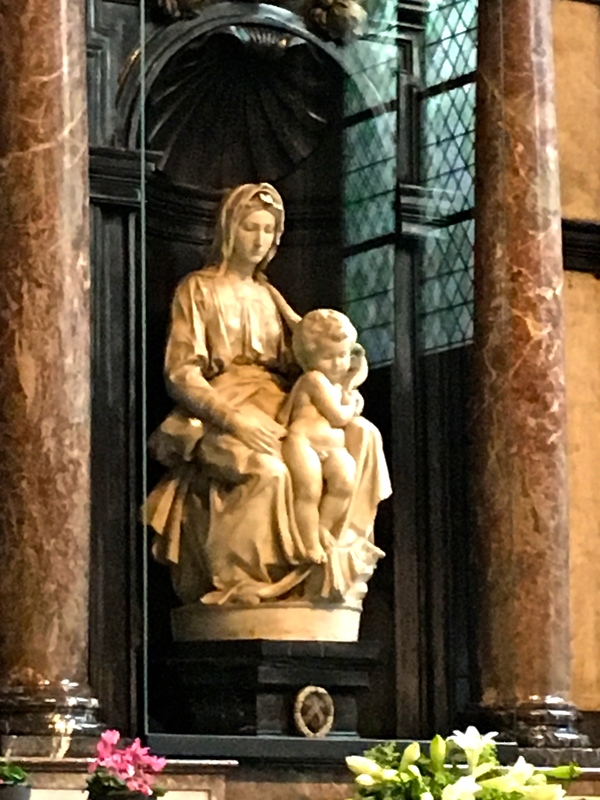 While visiting Tuscany, a wealthy Bruges businessman bought Michelangelo’s Madonna and Child and brought it back home to sit atop his tomb. 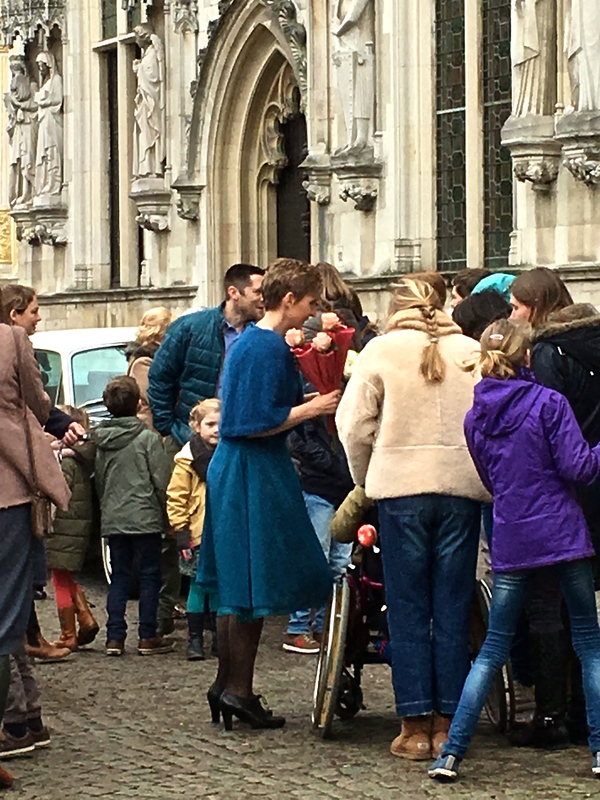 George Clooney’s The Monuments Men motivated our visit to this church. If you haven’t seen it, it’s another good film to put on your bucket list. It tells the true story of a group of scholars who ran around Europe saving artwork from the Nazi’s. One of the key plot lines and most dramatic moments in the movie is the rescue of a statue in this church: The Madonna and Child by Michelangelo (1504) — the only piece that left Italy in his lifetime. Pretty friggin’ spectacular. At age 25 and the mother of a toddler, Mary (left) fell from her horse and died. Her dad was killed in battle in 1477. 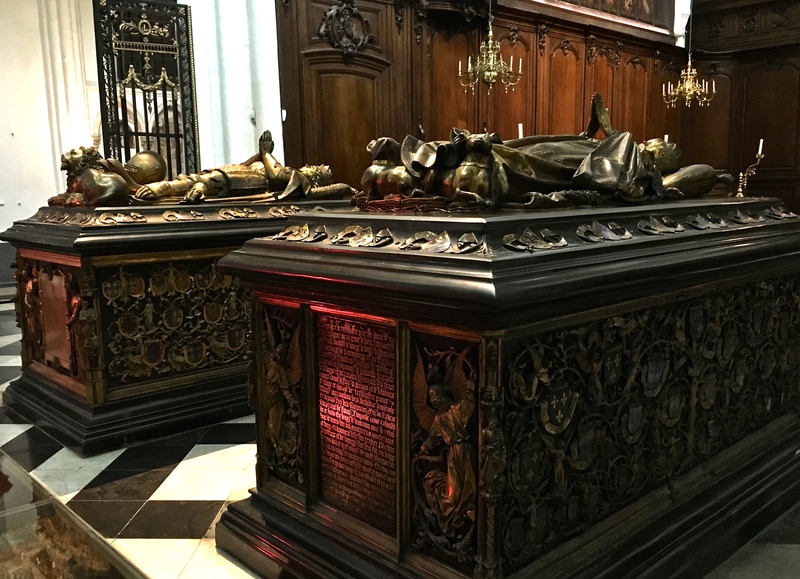 The rest of the church isn’t too shabby, either, and includes some sinuous Renaissance carvings along the back of the choir, as well as the impressive tombs of local rulers Mary of Burgundy and her dad, Charles the Bold. The most unusual crypts, though, are those that were found in a 1979 excavation beneath the altar. They bear primitive paintings of the Holy Family that remind me of the “royals” found on the face cards in a deck of playing cards. The theatrical statues all give a friendly wave to Matthew. It’s hard to get a decent picture of the 13th-century burial crypts due to the protective glass. But if you look closely, you can see crosses and angels painted on their sides. Most of the tomb paintings feature Mary as the Queen of Heaven. It’s her job to plead for the salvation of the dead person. Not to be disrespectful, but doesn’t she look a bit like the Queen of Hearts in a deck of cards? And baby Jesus looks a little like Stewie from “The Family Guy.” Maybe it’s that snarky look on his face, like he’s about to crack his mama in the head with the globe in his hand. Most of the tombs also have angels swinging thuribles (incense burners.) I think this would make a great tattoo. 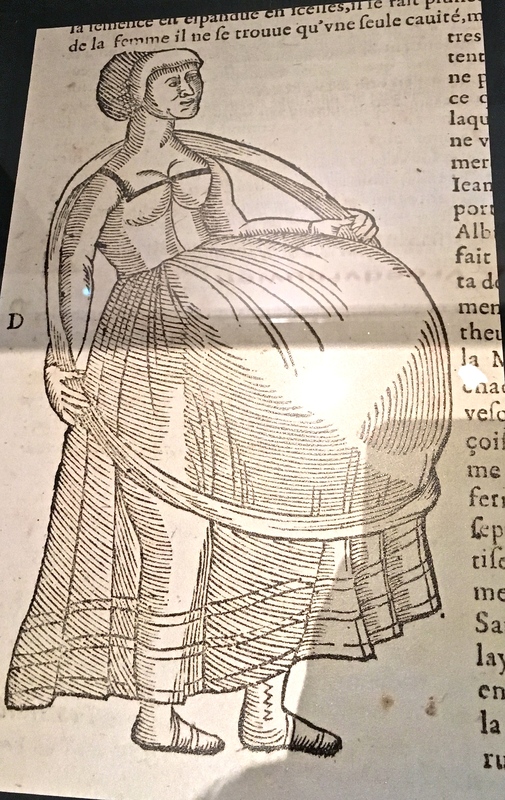 Pictured is a contraption designed to support a pregnant woman’s belly. Who would’ve thought the Hula Hoop was a Medieval invention? And what the heck has she got in there, anyway? Is she the Middle Ages’ Octomom? Probably the most unique museum I’ve visited in a while is the Memling. It’s housed in St. Johns, a former Medieval hospital. So alongside incredible Flemish Primitive paintings by hometown boy Hans Memling, you can check out macabre medical equipment from the Middle Ages. Nearby is the Groeninge Museum, which holds more spellbinding paintings by Memling, van Eyke, and their contemporaries. About 500 years ago, hospital beds for the sick and dying poor folk filled what is now the Memling Museum. Nuns dished out comfort more than medicines, which were pretty limited at best during the Medieval period. Today, the interior of the Museum looks much the same, minus the beds. The St. Ursula’s Shrine (c. 1489) is Hans Memling’s triumph. It’s considered a masterpiece of Flemish Primitives painting. Meant to hold the remains of St. Ursula, it mimics a Gothic church, with the paintings acting as stained glass. A portrait shows the nuns of St. John’s Hospital admiring Memling’s completed St. Ursula paintings. Utterly spent, Memling collapses. But somehow, he still manages to look romantically artistic while one pretty young nun fusses over him. Jan van Eyck — often called the world’s first and greatest oil painter — is classified as a “Flemish Primitives” artist. The term simply means that the Flemish (who were the most refined artists in the 1400s) hadn’t yet perfectly mastered 3-D perspective. This painting, entitled “Mother and Child with Canon Joris van der Paele,” is van Eyck’s masterpiece, painted in 1439. One characteristic of Flemish Primitives is the incredible realistic detail they manage to capture. You can see every bump, blemish, and broken blood vessel in this gouty old canon’s face. 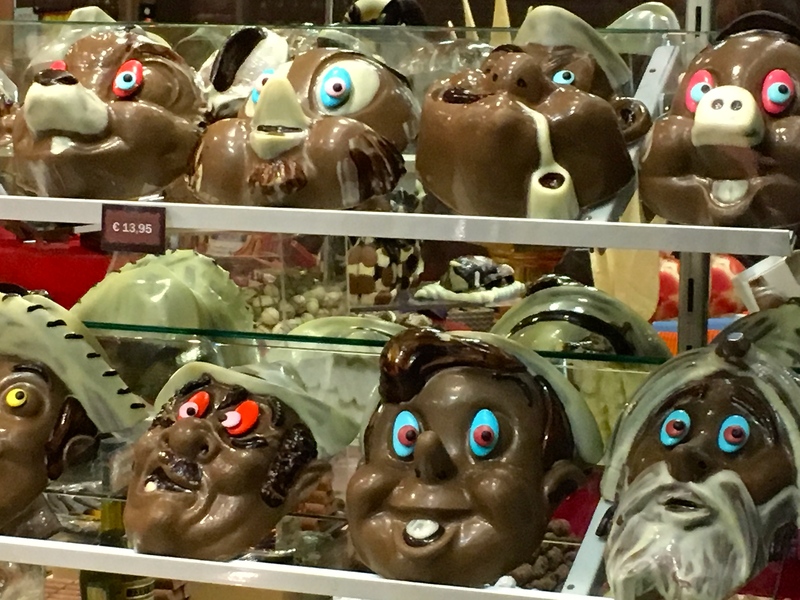 Who doesn’t want a creepy cartoon character made of chocolate? 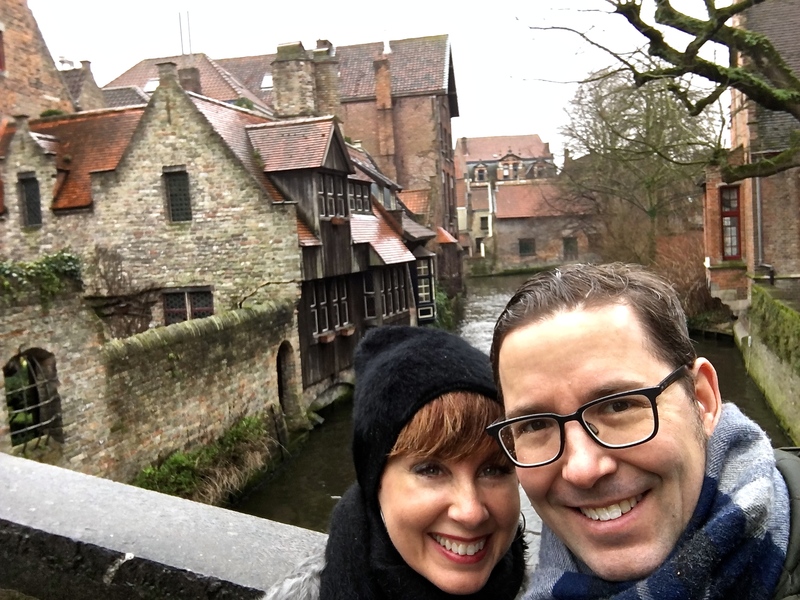 While in Bruges, Matthew and I enjoyed several fine meals of moules (mussels) and frites (french fries) — and we ate at least five pounds of chocolate. The latter comes in every conceivable shape and form, from sacred, to frankly pornographic. Belgium has got to be a nightmare for dieters and diabetics. Romantic ambience on Valentine’s Day. During our Valentine’s dinner, Matthew and I asked our waiter about the typical Belgian diet. I wondered how often he ate steak frites (I was convinced it was a meal offered mostly to vacationing tourists.) “I probably eat them at least three times a week; that’s typical for most Belgians. We ride bikes and walk a lot,” he said. I didn’t have the heart to ask him about his cholesterol level. Our mouthwatering meal of traditional Flemish stew and frites at the adorable Gruuthusehof. Frites, by the way, were invented by the Belgians, not the French. Belgian frites are fried twice to make them super crispy. Matthew inhales the fragrance of his curried moules, while I try to photograph him through the steam of my own pile of mussels. A little T&A chocolate for every racial preference. Some of the “Aw, shucks” chocolate cuties. And for those who like to combine their vices. I’ll close my long soliloquy with a brief footnote that Bruges is one of the most romantic cities in which to take an after-dinner stroll. And I think the photos below prove my point. Note the cute bridge in the distance. A quiet canal at sunset. One of the tourist boats taking a much-needed nap for the night. One night, we strolled into the Burg Square and happened upon an art installation that projected moving graphics upon the wall of the building with the simplest facade. We watched it three times, it was so cool.